This campaign will provide a crowdfunding platform in the three months following September 2018, so that anyone who is moved by this cause can make their contribution online. Organized collectively, the fundraising idea originated out of respect for the life of Mestre João Grande. I went to the London event, which was awesome!!! We won the berimbau auction (£175!) by pooling our resources together – there were eight Mojuba students at the event. Nearly $6 thousand dollars were raised by London event! And here is “Ninjanni’s” magic moment, when he kicked off a small ball from the top of a water bottle. Other’s had tried before and failed! He was coached by Mestre Poncianinho who told him to point his kick. 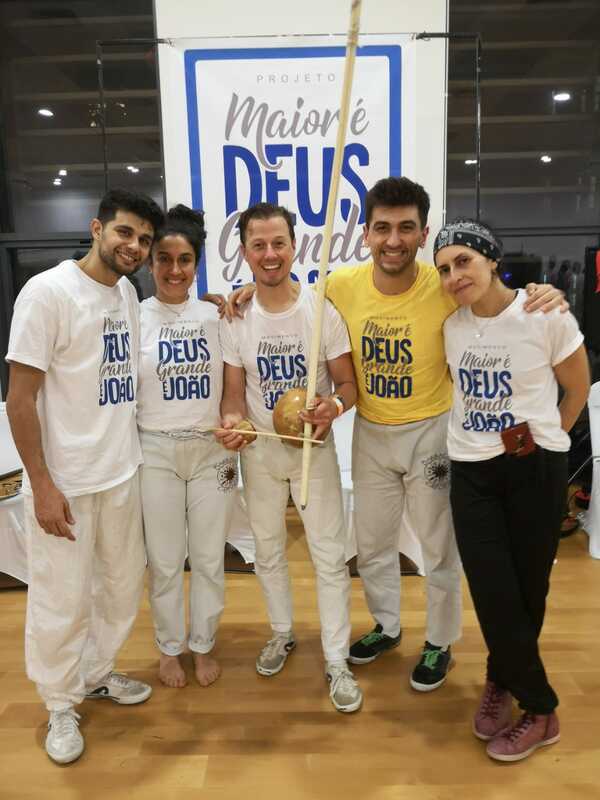 Mestre Poncianinho and Mojuba students with Berimbau bought at auction.